Long-eared Owls in willow thicket! Yesterday, along with a few other folks, I found myself skirting along a large wetland complex in the western marshes of Lake Erie. It was a gloomy, overcast day, with wet snow/rain spitting constantly in hypothermia-inducing temperatures. Nonetheless, spring was in the air, if one were to believe the birds. Flocks of blackbirds were here and there, and the boldest of the early returning male Red-winged Blackbirds were teed up and proclaiming their territories with guttural conk-ah-REE-onks! Waterfowl were on the move, and scores of Tundra Swans were moving about, restless to push on north to their Arctic breeding grounds. In spite of all the conspicuous avian action, our attention was riveted to the innocuous looking willow thicket above, at least for a memorable while. 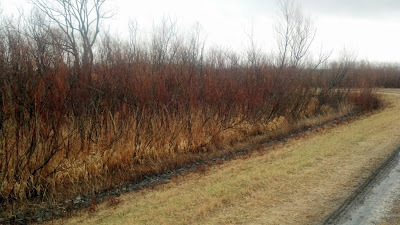 This shrubby copse is just like acres and acres of the same stuff in Lake Erie wetlands, but this patch held a special treat. In fact, I suspect that many such thickets hold the feathered treats that we'll behold in just a second - it's just that few people look for things in such places. Look closely - we're being watched! A Long-eared Owl, Asio otus, peers out at your narrator and his companions. This owl and its compadres were devilishly hard to spot in the dense willows. As we scanned the patch and ogled an owl, more would come to light. At one point, I was drawing a bead on this bird with my camera, and noticed another owl, barely visible, in the backdrop. We tallied four but I bet more were present. Our reluctance to disturb them precluded more aggressive surveying. By sidling along the roadway, some fifty feet away, we were able to discover open portals into the thicket and clearer views of some of the owls. This is where my 500 mm lens really comes in handy. It isn't necessary to impinge on the birds' comfort zone in order to make decent photos. I also had my scope along, and was able to set that up a fair distance away and still provide everyone with killer looks, same as in this photo. The owls noticed us, obviously - what do they NOT notice? - but never showed signs of being on high alert. Take a close look at this owl. A very cool and almost surreal element of owl physiology is on display. The owl in the previous photo, and the chap above were both facing away from the road. But wait - they're still looking directly at the camera! Owls have fourteen neck vertebra, double our seven, and that allows them to twist their neck nearly 180 degrees and look directly behind them. Long-eared Owls are not a rare bird, and are common throughout much of the northern boreal forest. 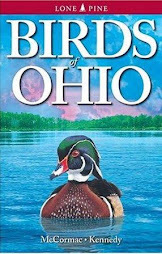 They stage poorly understood southward movements in winter, and are regular visitors to Ohio and other states south of their primary breeding range. There are undoubtedly FAR more Long-eared Owls around than is supected, and when one sees these masters of camouflage imbedded in a dense willow thicket such as this, it becomes apparent just how easily they can be missed. I think many Ohio birders have a skewed perception of Long-eareds' winter habitat, because so many people are used to seeing them in the pine groves at Killdeer Plains Wildlife Area and other select conifer groves. But it should be remembered that, with the exception of the Red Cedar, Juniperus virginiana, and Virginia Pine, Pinus virginiana, conifers are rather local and limited in distribution in Ohio. And even the two aforementioned species are not common statewide, and the other five native species suitable for owl roosting are very limited in distribution. In several areas where Long-eared Owls regularly turn up roosting in conifers, such as Killdeer Plains, there are NO native conifers or at best a smattering of Red Cedar. The birds are roosting in artificial plantings. On several occasions, I've seen Long-eared Owls roosting amongst the dense gnarled branches of Pin Oak trees, Quercus palustris, and I suspect that's where the Killdeer Plains pine grove birds retreat when the human presence becomes too much. Pin Oaks are often very common in and around good Long-eared sites. They also favor dense grapevine tangles, which are found nearly everywhere, and good luck spotting owls in such haunts. A key to devining possible locations for Long-eared Owls involves suitable hunting habitat. They hunt over open and semi-open ground, and if an area has Short-eared Owls and Northern Harriers, there is a good chance that Long-eareds are also in the immediate vicinity. The latter are strictly nocturnal, though, and thus much harder to discover. It involves lots of peeking and peering into dense vegetation, and/or much luck. I want to thank Jeff Finn for pointing these birds out to us, and taking us to the spot. It's an interesting story as to how they were discovered, which was quite serendipitous. The location cannot be divulged, though, as the owls are on lands that are not publicly accessible, and I am always loathe to reveal Long-eared Owl roost sites as human pressure can become heavy once they're known. But now that we've seen these deciduous willow-roosting birds, we have a good search image for a "new" habitat in which to seek owls. While traipsing through Kiwanis Park last Sunday, where I made the Skunk-cabbage images of the previous post, I encountered the remnants of this plant. It is Virginia Stickseed, Hackelia virginiana, and it is a much cursed plant indeed. When young or in bloom amongst the crush of other summertime greenery, Virginia Stickseed does not stand out and is likely to be overlooked. With age and the ripening of fruit, even non-botanist explorers notice - and curse - this rather weedy borage family member. The fruit of the stickseed, shown above, are a marvelous adaptation for mammalian dispersal. The exterior of the fruit is heavily armored with stiff hook-tipped bristles - ideal for adhering to passersby. Many a hiker has had the misfortune of inadvertently bumbling through a patch of this plant, only to look down and see that his/her legs are covered with burs. While humans now play a role in moving stickseed and other plants around, our adhesive-fruited flora co-evolved with animals such as this White-tailed Deer. The aforementioned Virginia Stickseed can be a robust plant, and typical luxuriant specimens place their fruit at an altitude perfect for catching furry deer bodies. It probably does not behoove wild mammals to become coated in sticky burs, and their fur has become quite sleek and good at repelling would-be hitchhikers, but some of the plant fruit will stick at least long enough to ride to a new locale. Just as surely as tanagers and warblers migrate, so do plants. Plants have all sorts of migratory ploys in their bag of tricks, including wind and water dispersal, transport by all manner of insects, forceful physical ejection of seeds, and more. People probably tend to notice the mammalian dispersal plant tactics the most, because these plants don't discriminate against the various mammal species so we get involved in the process too. A real Jeckyll and Hyde plant, the Showy Tick-trefoil, Desmodium paniculatum. This pea family member is decidedly an ooh and ahh plant when in flower. When it goes to seed, the same fawning admirers often end up cursing the tick-trefoil. Desmodiums produce flat, often triangular fruit known as loments, and loments adhere wonderfully to pants legs and other clothing. I'm sure you've picked some up in your travels. Columbus Dispatch photographer Eric Albrecht is one of the best in the business, and goes to any length to get his shots as on this trip into Shawnee State Forest. Beating the brush like this often means legs covered with Desmodium loments. If Eric were to fail to rid himself of all the sticky loments, he is liable to transport them far distances and thus aid in the plant's dispersal. Bur-bearing plants are found in many families, and exhibit great variation in stature. There are even elfin mammalian dispersal plants that hold their fruit at the low level of a chipmunk. While the odd bur undoubtedly gets taken for a ride by hyperactive chipmunks, their primary method of plant transportation is caching, and forgetting, seeds. White-footed mice and other rodents likely transport their share of seeds, too, without intending to. Mice and other rodents often dwell in rocky cliffs and outcrops, and such sites are home to this lovely little plant, the Dwarf Enchanter's Nightshade, Circaea alpina. Its tiny ellipsoid fruit are beset with sticky hairs, and are in perfect position to latch onto small rodents making the rounds of the rocks at night. Thus, newer and higher ledges can be occupied by the plant, thanks to the mice. Long-fruited Snakeroot, Sanicula trifoliata, is one of four very common Sanicula species in Ohio. 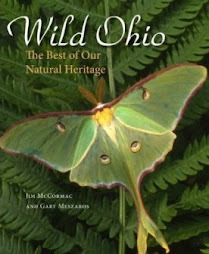 This one shares limelight with several other dozen species of plants that were discovered and described to science in Ohio. The plant probably cares less about that distinction than it does about sticking its burs to some passing mammal. An Eastern Cottontail, a likely common transporter of Sanicula snakeroots. These plants often grow luxuriantly in prime rabbit habitat, and are of the perfect height to snare passing bunnies. Next summer and fall, when you pause to pluck burs from your clothes and cast them to the ground, just take note that you've been outfoxed by the plant world. The skunks burst forth - it is offically spring! A springy quagmire a mere seven minutes from my house, and a place to which I make an annual pilgrimage each year to confirm spring's arrival. I know that I write about this every year, but I cannot help myself. This has been a long wintry winter, and I and many other northern tundra-boys and girls eagerly seek out definitive signs of spring. Speaking of the title of this post, and skunks, the mammalian form is also in full spring fever. You'll be smelling their pungent musk frequently, and seeing the aftermath of skunks who were unsuccessful in crossing the road. But this story is about Skunk-cabbage. The aforementioned boggy spring is Kiwanis Park, and I was there this morning to document the full-fledged emergence of the Skunk-cabbage, Symplocarpus foetidus. I was at this spot for other purposes back on January 16, and was shocked to see that at least one of the Skunk-cabbage plants was already in full bloom. That one jumped the gun by a longshot; today, hundreds of plants were up and the colony was at or near its peak of bloom. If you are a plant bold enough to thrust from the mire in February, it helps to be thermogenic. 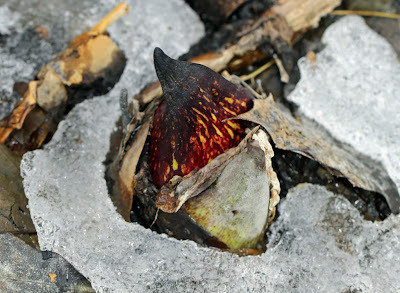 Skunk-cabbage produce their own heat as a by-product of growth, and the immediate environs of an actively growing skunk is plenty warm enough to melt away the snow and ice. A luxuriant passel of Skunk-cabbage. Each of those curious fleshy conical spathes harbors the flowers. The purple and green hoods provide a toasty warm tent that shields the pollen-producing parts from the often much chillier conditions outside. It might be several dozen degrees warmer inside the spathe! 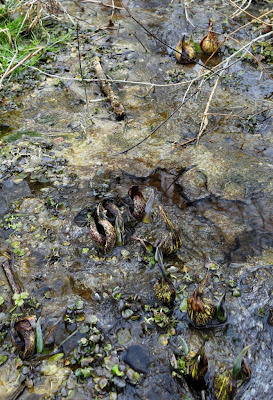 While Skunk-cabbage's choice of habitat often limits who might see them - casual hikers tend to avoid boot-sucking quagmires in late winter - I'm sure the unititated occasionally stumble into them. I wonder what someone who has no idea of their existence thinks when they clap eyes on a flowering skunker. Probably think it's a weird fungus of some sort, rather than a close relative of one of our most beloved spring wildflowers, the Jack-in-the-pulpit, Arisaema triphyllum. Proof of flowering is in the pollen, as botanist Daniel Boone would say. To see the true flowers of Skunk-cabbage, one must peek through the flap in the spathe. If you do, this is what you will see. 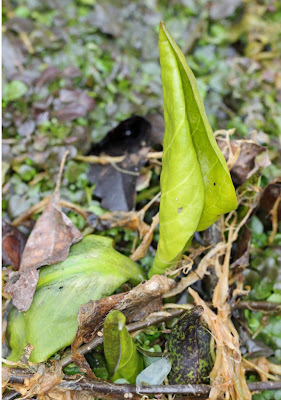 The oblong-shaped club is the spadix, which is littered with the tiny greenish flowers. 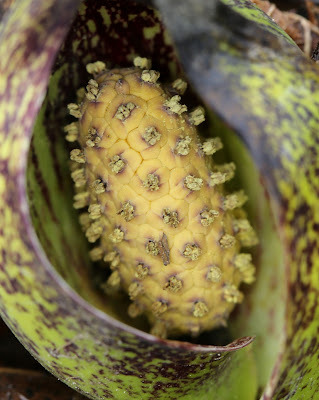 Look closely and you'll see pollen grains on the flowers and the surface of the spadix. 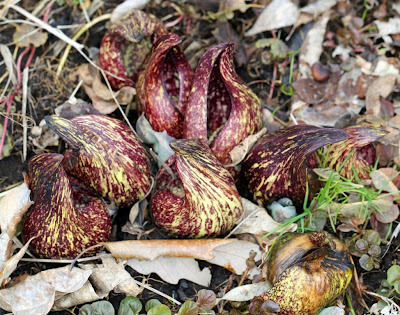 The blooming and leafout of Skunk-cabbage is largely asynchronous: the leaves do not emerge and reach full luxuriance until after the flowers are done and withered. Only a few leaves were in the early stages of unfurling today. Come back later in spring and it'll resemble a well fertilized cabbage garden in this spot. The botanical skunks long get the jump on more traditional wildflowers. This raggedly looking rosette of Swamp Buttercup, Ranunculus hispidus, leaves was growing with the Skunk-cabbage, but it'll be two months or so before their glossy lemon-yellow flowers show themselves. The birds know that spring is here, though. Well making my photos, I was serenaded by Northern Cardinals, Carolina Wrens, Northern Flickers, Song Sparrows, Mourning Doves, and others. While it may only be late February, now that the Skunk-cabbage are at the pinnacle of bloom, there is no denying the impending Spring. New River Birding & Nature Festival, here we come! The famous New River bridge at Fayetteville, West Virginia, as seen from Long Point. The deck of that bridge is about 877 feet above the roiling waters of the ancient New River, which is actually one of the world's oldest streams. The scenery in this part of the world is nearly unrivaled, anywhere, and the biodiversity is nothing short of astonishing. Enter the New River Birding & Nature Festival - the best way for birders and others interested in nature to immerse themselves in the flora and fauna of southern West Virginia. This year, the festival ranges from April 29 - May 4 and YOU should be there! This pleased group is in the midst of watching a male Golden-winged Warbler make its rounds, singing all the while. Topnotch and often hard to find birds such as the Golden-winged are a festival staple. Helping everyone to find the specialties is an all-star cast of guides, many of whom pull double duty as evening speakers. 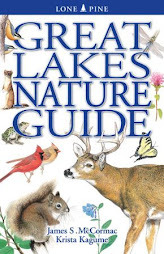 GO HERE for a roster of the guides. The word "Nature" is in the event's name for a reason. The mountains of West Virginia teem with all sorts of nonbird animals, everything from Box Turtles to Worm Snakes to Red Efts to Black Bears. We pause to look at them all. A real field of dreams, the fabled Bobolink field, high on a grassy knoll well up on a remote mountain. Although most of us have probably seen Robert O' Lincoln, it's incomparable to clap eyes on the black, golden, and white males skylarking all over this magical meadow, gurgling their bouyant R-2 D-2 melodies to the assuming females. Certainly not my best effort in the realm of bird photography, but this shot tells a story. It is a bird that not many people get to lay eyes on - a female Cerulean Warbler. You'll generally see far more of the sky-blue males. The mountain where I made this image is full of Ceruleans - probably the greatest density that I've seen anywhere. What was particularly cool about this particular bird is that she was actively harvesting the exfoliating bark from those grapevines for her nest. 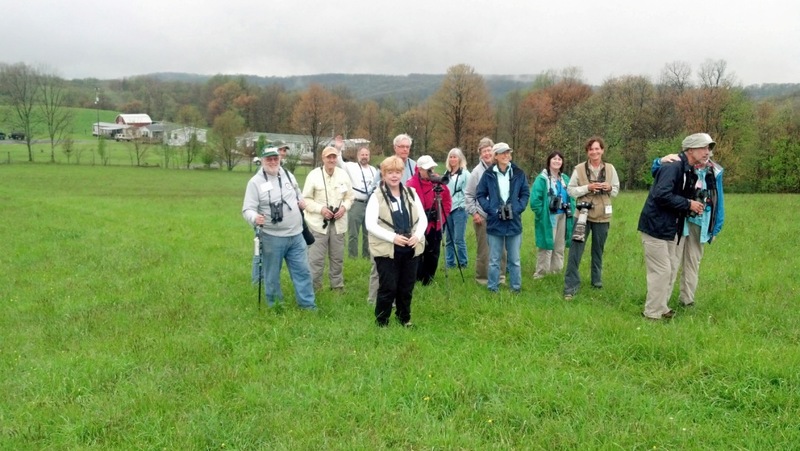 That's another cool dimension of the New River Birding & Nature Festival - we know tons of hotspots where rare experiences such as this are possible, if not probable. Seeing a glimpse of a Cerulean Warbler high in a treetop is Birding; observing a female gathering nest material at close range is Bird Watching! I am tasked with leading groups to Cranberry Glades, way up in the Monongahela National Forest, and what an onerous job that is - NOT! Even though the boardwalk that winds through the gnarled Red Spruce is only 1/2 mile in length, it can take a few hours to traverse its path. The birds are insane - it's like being teleported to Canada. Winter Wrens, Canada Warblers, Red-breasted Nuthatches, Northern Waterthrushes and many other boreal species breed here. There is a local nesting population of Red Crossbill, and they often frequent the nearby visitor's center. The plant life is incredible and includes numerous interesting and rare species. Almost stunning beyond words, a bouquet of brilliant orange Flame Azalea flowers enlivens an early spring West Virginia woodland. The botanical diversity is extreme, and I've found that even people who have not paid plants much mind find themselves getting caught up in the charms of vegetable matter such as this azalea. Bring a camera - photo ops abound. 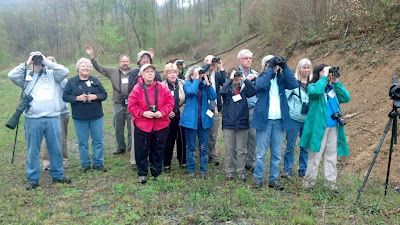 Another happy group, this time because a cooperative male Mourning Warbler sang its heart out for them as it worked the margins of its turf. We see a lot of repeat customers at the New River Birding & Nature Festival, and small wonder. I think this'll be my seventh consecutive year leading trips, and it is without doubt a highlight of the season for me. I think you'll like this part of West Virginia, too. For the complete festival lowdown, including registration inormation, CLICK HERE. Pastoral Knox County, Ohio. This is Barn Owl country, and some of the barns such as the one in this photo are haunted - haunted by monkey-faced owls. Whether or not this particular barn has an owl in residence I do not know, but it isn't far from a barn that does. Barns Owls are certainly not common in Ohio, and are officially listed as threatened. I suspect there are many more than we know about, though. They are strictly nocturnal, and only likely to be found when roosting during the daytime, and the roost is likely to be in someone's private farm outbuilding, and such places are not frequented by birders. Thus, I was delighted to get a recent email, telling me of an owl in residence in the aforementioned Knox County. The homeowners are nice as can be, and were willing to allow me to visit and have look at their owl. So, on a recent Saturday, I piled Peter King and Bruce Miller in the car and headed up to meet the Barn Owl's landlords, and hopefully the owl as well. Upon entering the barn, it didn't take but a New York second to figure out where the bird's favorite haunt was - the floor underneath was dappled with enormous owl pellets and painted with a fair bit of whitewash. We glanced up into the rafters, and there she was, tucked in and paying us absolutely no mind. And it is a "she": note the lovely tawny wash to the breast and the copious sprinkling of black dots. Males tend to be much whiter and considerably less speckled. This bird does appear to have an injury of some sort on its breast, but apparently it is healthy enough and eating like a horse. It's been using the barn for over a month, and the piles of pellets attest to its vole-catching prowess. This is a working farm and a working barn, and apparently the owl has become thoroughly accustomed to activity. Twenty feet or so below the owl lurked Peter, Bruce, myself, and the lady of the house, although we spoke in muted whispers. At our feet gamboled several very active kittens, the progeny of a couple of adult barn cats. And there was Tig, a large and rather ferocious appearing "guard dog", who was nosing the kittens about and occasionally letting loose a bark. None of this hubbub caused the owl to as much as flinch, let alone open its eyes. From my experience, there are basically two types of Barn Owl behavior regarding barn-roosting birds. Some, like this animal, are quite tame and not put off by people. They'll just remain perched high in the rafters or on the hay rail, and quiet observers - or even not so quiet ones - will not cause them apparent concern. But there are plenty of spooky Barn Owls. These birds do not like intruders, and as soon as someone enters their dwelling they'll promptly catapult out the nearest exit hole and into the wide open outdoors. These are the birds to leave alone. A Barn Owl ensconced in the shadowy rafters of a barn is a safe owl. A Barn Owl flushed from its fortress during the day becomes far more vulnerable to those who would eat or otherwise relentlessly dog the bird. This is an almost strictly nocturnal owl, and forcing one to be exposed to hawks, crows, jays, the watchful eyes of Great Horned Owls and all manner of tormentors, some deadly, some just annoying, is not the thing to do. Upon leaving the barn, I grabbed a couple of owl pellets. We retreated to another barn (owless) barn, and dissected one of them. Owl pellets are compact masses of indigestibles: fur, and bones. Several hours after swallowing a tasty mouse or vole, the owl commences to bob and gurgle like a frat boy that chugged too much beer, and out comes one of these surprisingly large pellets. The vole's skull is in the foreground, and various bones from the hapless victim can be seen projecting from its fur. An intact pellet is at the right. The homeowner was very interested in these pellets and their composition, as any right-minded intellectually curious person ought to be. Just today, she texted me a photo of a pellet that she had much more painstakingly dismantled. It contained five (5!) vole and mice skulls! Apparently the owl is flourishing in its Knox County digs, and I hope there are many others in the area. Daughmer Savanna in Crawford County, one of Ohio's newest state nature preserves. 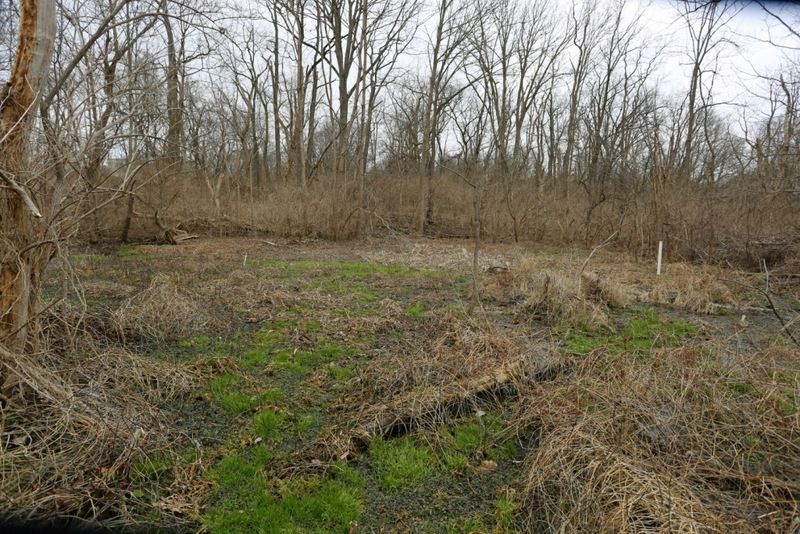 The Ohio Division of Natural Areas and Preserves (DNAP) was instrumental in assuring the long-term protection of this stunning site, along with the Crawford County Park District. DNAP, along with the Cleveland Museum of Natural History and other partners, hosts the Ohio Botanical Symposium, which will be held on Friday, April 5th. This is the 13th year for the symposium, which began with about 35 people in a classroom at Ohio State University. From humble beginnings it has mushroomed into a can't-miss 400+ person botanical extravaganza. It's held at the Villa Milano in Columbus, and does fill up, so get your tickets soon. Organizers have put together another excellent agenda, as can be seen HERE, along with registration information. Don't dawdle; the symposium is an outstanding way to start the spring. A snippet of the 65,000 acre Shawnee State Forest in southern Ohio. Hard to believe this is the Buckeye State, eh? If you've read this blog with any regularity you've probably seen some of the scores of posts that I've made about Shawnee and its flora and fauna over the years. This is one of the best wilderness areas in the Midwest, and coupled with the (nearly) adjacent Edge of Appalachia Preserve, there is some 80,000 acres to roam. 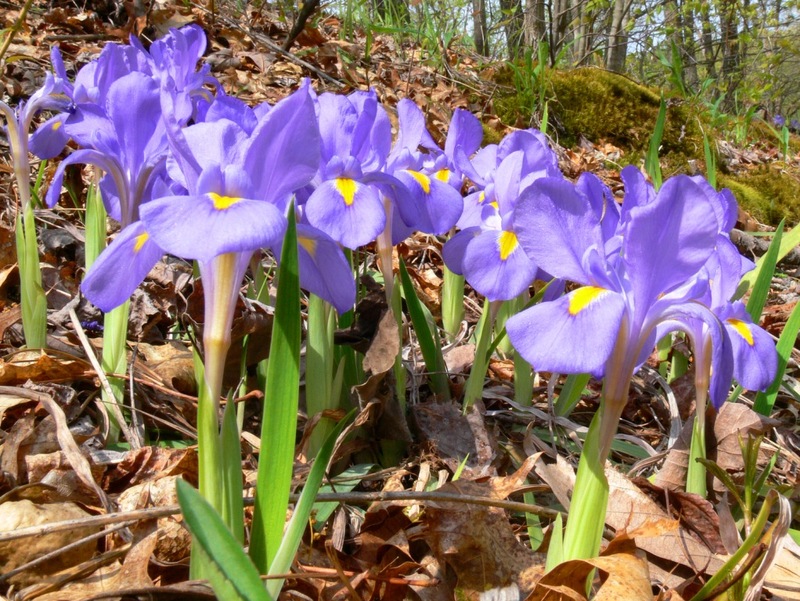 The area teems with rare flora, and a staggering abundance of more common plants. A visit to Shawnee and vicinity is always rewarding, and once you've been once, you're almost certain to visit again. The best indoctrination into Shawnee and its multitude of nooks and crannies is with experts who know it well: enter Flora-Quest. This field trip focused botanical event will soon host its 7th consecutive conference the weekend of May 3-5. Early May is the peak of spring wildflowers, and by the end of F-Q your mind will be spinning at all of the magnificent plants that you'll have encountered. If you've got a camera, your cards will be stuffed with megabytes of digitized botanical beauties. Space is rather limited at F-Q, and it does fill up, so this is another event to sign onto soon. All of the details are RIGHT HERE. Cross-vine, Bignonia capreolata, Adams County, Ohio, April 7th, 2012. The other, better looking Trumpet-creeper! Striped Maple, Acer pensylvanicum, April 15, 2012, Shenandoah National Park, Virginia. An endangered species in Ohio. Birdfoot Violet, Viola pedata, April 25, 2012, Shawnee State Forest, Ohio. Flora-questers will get to see this beauty, which is arguably the showiest violet in North America. Painted Trillium, Trillium undulatum, May 1, 2012, Monongehala National Forest, West Virginia. Another Ohio endangered species. Pink Lady's-slipper, Cypripedium acaule, May 1, 2012, Babcock State Park, West Virginia. This stunning orchid is locally common in Shawnee State Forest and if you're at Flora-Quest you'll see 'em. Dwarf Iris, Iris verna, May 3, 2008, Shawnee State Forest, Ohio. A roadside bank just a stone's throw from the state park lodge is blanketed with this Ohio threatened species, which is our only upland species of Iris. Carolina Catchfly, Silene caroliniana, May 5, 2007, Shawnee State Forest, Ohio. These botanical stunners grow on nearly barren shaley hillsides and their brilliant flowers are jarring against the stark backdrop. Spider Milkweed, Asclepias viridis, May 25, 2009, Edge of Appalachia Preserve, Adams County, Ohio. This large-flowered milkweed grows in prairie barrens and is sometimes known by the whimsical name "Green Antelopehorn". 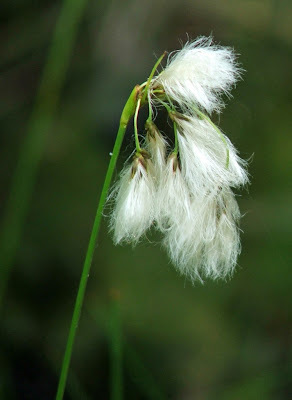 Green Cottongrass, Eriophorum viridicarinatum, June 8, 2005, Cedar Bog, Urbana, Ohio. 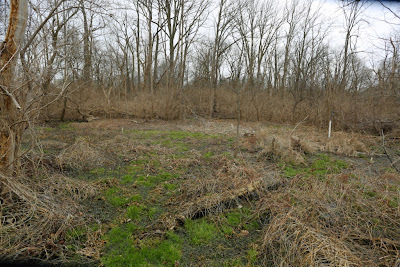 This rarity is confined to fens in Ohio, and is not a grass, but a sedge. Crested Coralroot, Hexalectris spicata, July 14, 2012, prairie in Adams County, Ohio. One of forty-six native orchid species in Ohio (there is one well established nonnative species). Obedient Plant, Physostegia virginiana, August 19, 2011, Willow Point Wildlife Area, Ohio. 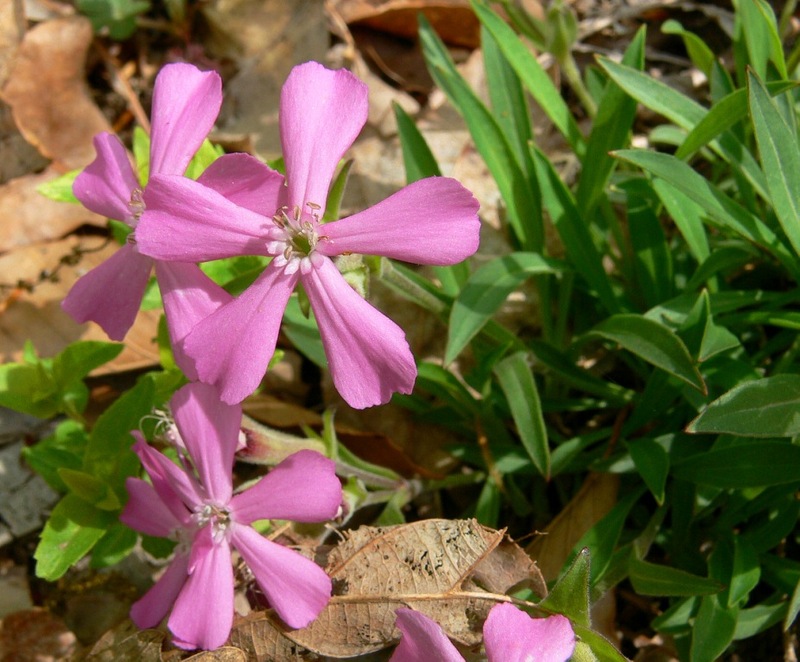 The curious common name stems from the flowers, which can be twisted around the stem as if on an axle, and will remain where placed. Cardinal Flower, Lobelia cardinalis, August 31, 2011, Crane Hollow State Nature Preserve, Ohio. Easily in the top tier of our most striking wildflowers, the specimen in this photo was particularly engaging - it stood about seven feet tall! Climbing Fern, Lygodium palmatum, September 15, 2007, Shawnee State Forest, Ohio. 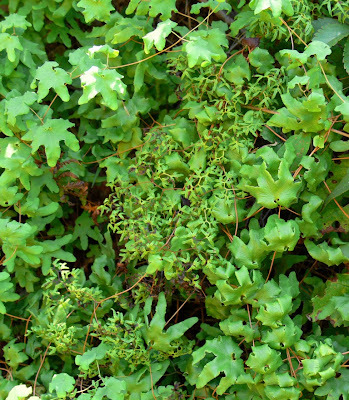 This strange fern is rare and local in southeastern Ohio. 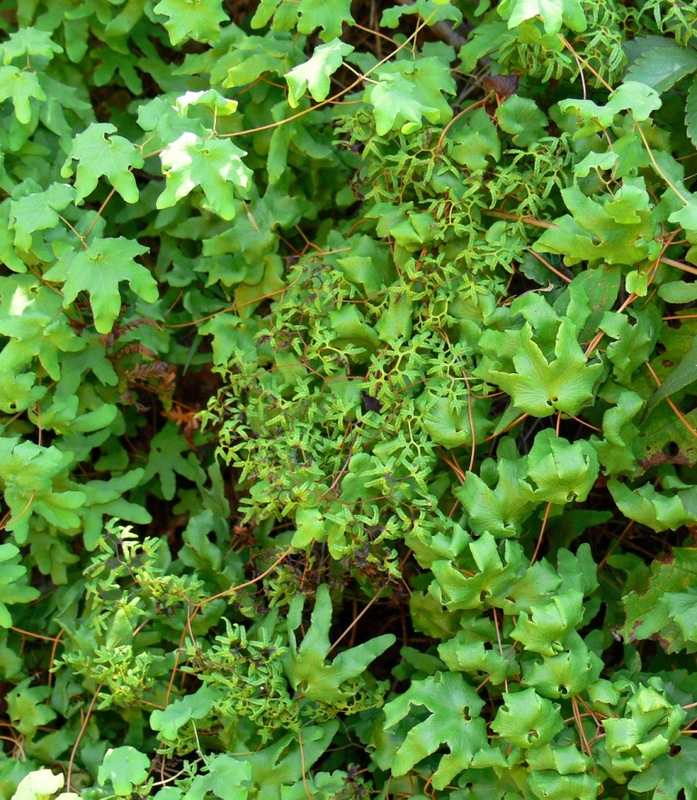 The broader leaves are sterile; the tiny lacy leaves are the fertile spore-bearing leaves. Fringed Gentian, Gentianopsis virgata, October 6, 2012, Betsch Fen, Ohio. A fitting grand finale to Ohio's botanical season, but there is much to see between now and the gentian's closure to the season. The annual Ohio Natural History Conference rapidly approaches! Mark your calendars for Saturday, February 23, and plan a visit to the Ohio Historical Society's intriguing building in Columbus. This event, as always, is sponsored and orchestrated by the Ohio Biological Survey, which is celebrating its 100th anniversary. This year's engaging crop of speakers includes Andy Jones of the Cleveland Museum of Natural History, Kathy Smith of the OSU Extension Service, Herman Mays of the Cincinnati Museum Center, August Froehlich with The Nature Conservancy, Katrina Schultes with the U.S. forest Service, and keynote speaker Scott Loarie of Stanford University, creator of iNaturalist. Technology is revolutionizing the way that we learn about and even interact with nature, and we'll learn a lot about the interplay between humans, the natural world, and technological gizmos. These conferences are always rewarding, and a good opportunity to meet many of your peers. For the complete lowdown, and to register, GO HERE. And, walk-ins are always welcome so feel free to show up that morning and join the festivities. 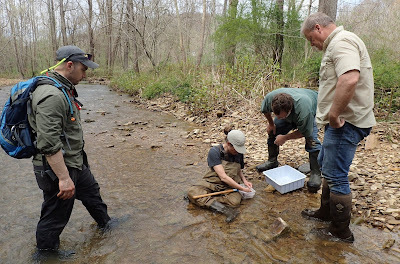 Yesterday, I had the pleasure of heading NNE to the wildlands of the Mohican region with Bruce Miller and Peter King. We had a few objectives in mind: investigating a report of a Barn Owl that had just come to light, seeing the now famous Evening Grosbeak flock, and searching for a Northern Shrike that has occasionally been seen along the route that we would be taking. We scored on the owl and grosbeaks - more, perhaps, to follow on those. But as is often the case when spending time afield, something cool and totally unexpected pops into view. This is such a story; a tale of a foxily serendipitous find. The boys and I had made our rounds, relishing the spectacle of a ghostly Barn Owl in its dimly lit haunts, and marveling over a flock of noisy and gluttonous Evening Grosbeaks. We had just circled about the area where the aforementioned Northern Shrike had been seen, but no luck on the butcherbird, although a consolatory Rough-legged Hawk put on a show. Well, two out of three ain't bad. We were on our way to the Mohican State Park lodge for lunch, and the driver - me - had just hung a left into the lodge's long entrance road, when STOP - BACK, BACK, BACK!!! roared Peter, blustering and choking out his words. I knew some new game was afoot, although I wasn't sure what. A quick jab of the transmission into reverse and a stab of the throttle, and I saw what had caught his eye. A gorgeous Red Fox, lazing right out in the open, on the edge of the lawn! Dopey with the warmth of the sun's rays and the promise of a soon to arrive spring, the fox barely regarded his new-found admirers. In short order, big telephoto lenses were bristling from the car's windows, and scads of images were fired off, burst-mode style. As sharp of ear as they are of eye, the distant clicks of cameras finally made the fox beam on on us, wondering no doubt as to who the fools were that were interrupting its sleepy reverie. We certainly did not want to bother this glorious animal, but a stunning photo-op with a wild Red Fox is as rare as hen's teeth, and we couldn't help ourselves. Finally the animal stood, shook off the dust, and turned to give us a baleful glare. It still sports the full luxuriance of its thick winter pelage - just have a look at that magnificent tail! The fox slowly sauntered into the adjacent woods, turning to take another look at the paparazzi. My hunch is that it has a den very nearby, and when the weather is sunny regularly loafs on the grassy bank. Even though the temperature was decidedly cool, we had not a half-hour before commented on how nice the sun's warm rays felt. Apparently this fox felt the same, prompting his bask. Sure enough, when we departed the lodge an hour or so later and motored back by this spot, our foxy friend was back, sprawled out on the lawn as before. Should you find yourself entering the lodge at Mohican, and it is a bright day, check the lawn behind the entrance sign and perhaps you'll also see this handsome beast. If you would like to read more about Red Foxes, HERE IS an article that I wrote about them a while back.